Since The Dawning is currently on-going in Destiny 2 we thought it would be nice to bring together some of the best wallpaper from the event, as well as the lore that fills in some of the background of it. Officially The Dawning is an event created by Bungie which is live around the Christmas period. In it Guardians can celebrate Christmas in Destiny 1 and Destiny 2, and they can receive gifts from the Vendors around the Tower as part of quests given for the event. In Destiny 2 there are gift schematics that require specific tasks to be completed with them in a Guardian’s inventory in order to create a gift to give to a Vendor, who will then give a gift to the Guardian in return. In terms of the lore The Dawning is a time when Guardians gather together to share in gifts and bring in the new year with celebrations. It originates from the early days of The Last City when survivors from around the system brought thousands of different customs to once place, all celebrating in different ways. The lanterns which are lit and sent into the air are a symbol of the Traveller’s Light guiding people through the Darkness, the ever-present enemy that hunts for the Traveller’s Light. 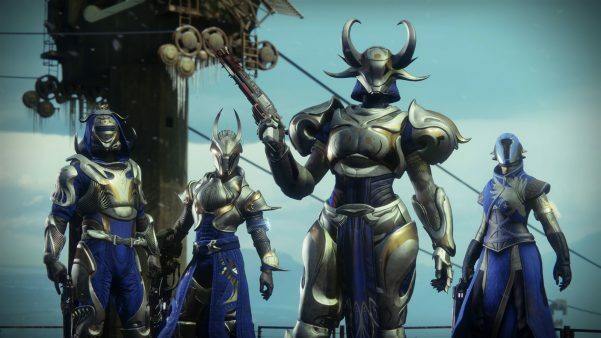 The Dawning has always brought with it new sets of Armour and Weapons that look fantastic, as well as a multitude of ways to earn them. The Sparrow Racing League was first introduced as part of The Dawning, spurring huge success that has gone on to result in SRL coming all the way from Destiny 1 to Destiny 2. In Destiny 2 there are various challenges that relate to completing matches in the Crucible and Strikes that have been altered as part of the event. Completing these challenges will reward a Guardian with Engrams which have a great chance of opening into event-specific gear. Perhaps most brilliant of all this year in The Dawning in Destiny 2 is the addition of snowball piles in Patrol areas, social spaces, and even Strikes. These piles can be used to pick up a snowball that can be thrown at other Guardians or at enemies. Hitting either can kill, but always inflicts a de-buff that significantly reduce the effectiveness of a Guardian or any enemy in general. Let us know what you think of the event in the comments.